ANAHEIM, Calif. -- The Toronto Blue Jays are struggling so badly, even when they get a huge break, they can't capitalize on it. Their first six batters went down in order against Jered Weaver, who had to leave after 24 pitches because of stiffness in his lower back. But the Jays got only two harmless singles over the final four innings against five relievers and lost their fifth straight, 5-2 to the Los Angeles Angels on Monday night. "We thought we finally caught a break when Weaver left, but they shut us down," manager John Gibbons said. "Weaver's different than he used to be and has a different style, but he's still one of the toughest guys around, so you feel good when he comes out of the game." Juan Francisco hit his 14th home run for the Blue Jays, who slipped three games behind AL East-leading Baltimore. J.A. Happ (7-5) was charged with five runs, seven hits and three walks in 4 1-3 innings. "We've seen him do that before," Gibbons said. "That's where he gets into trouble, when he loses the strike zone. Every now and then he'll go through those stretches where it deserts him. He's still got to throw it over the plate and take his chances and let them hit a ball at somebody." The Angels grabbed a 5-2 lead in the fifth. 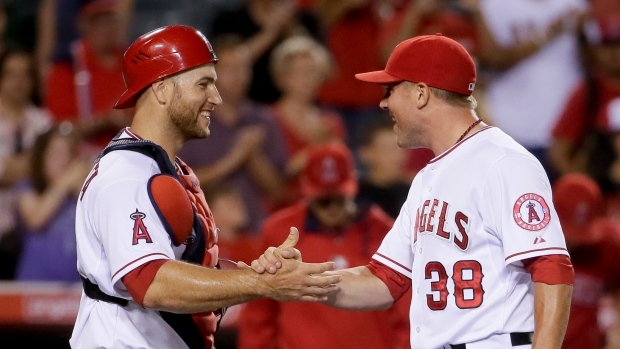 Chris Iannetta, who scored their first run in the third on Mike Trout's groundout, started the four-run rally with a leadoff double that a fan touched near the top of the 18-foot wall in right-centre field. Manager Mike Scioscia asked second base umpire Jim Wolf for a video review, hoping for a home run call he didn't get. Happ walked his next two batters before Albert Pujols hit a bloop single to right-centre that tied the score. It was his second bases-loaded hit in two days, after starting the season 0 for 13 in those situations. Josh Hamilton followed with a sacrifice fly, Howie Kendrick chased Happ with an RBI single through the box, and Erick Aybar greeted Chad Jenkins with an RBI double on the right-hander's first pitch. "We know he likes to throw fastballs, so we wanted to make him throw strikes," Hamilton said. "He's got really good stuff, so you've got to make him throw strikes. And if he doesn't then he gets into a bad count and have to throw a strike. Then you can do some damage with it." The winning pitcher was Matt Shoemaker (7-2), who made 61 pitches in his emergency stint while allowing two runs and five hits through 3 2-3 innings. The rookie right-hander had thrown 102 pitches last Thursday in a win over Houston. "It was unbelievable. You talk about trying to earn respect points, and Shoemaker definitely did that -- going on three days' rest," Weaver said. "That goes a long way. I mean, for him to step up and do what he did after not thinking he was going to pitch tonight was pretty spectacular. That was an awesome job by him, mentally, and you saw the way the rest of the bullpen came in and shut the door against a pretty good lineup." The Angels' recently acquired veteran duo of Joe Thatcher and Jason Grilli helped piece it together with Kevin Jepsen and Joe Smith, who got three outs for his 11th save. The Angels extended their home winning streak to 11 games, one shy of the franchise record set in 1967 -- their second season in Anaheim. They are 16 games over .500 for the first time since ending the 2012 season at 89-73, and remain 3 1/2 games behind AL West-leading Oakland. NOTES: Blue Jays RF Jose Bautista made his second straight start at 1B because of Edwin Encarnacion's strained right quadriceps, which landed the second-time All-Star on the 15-day disabled list Monday. Nolan Reimould was added to the major league roster and made his Blue Jays debut starting in CF and going 0 for 3 a day after he was claimed off waivers from Baltimore.